VeriCite DocumentationUser GuidesBrightspace User Guide LTI Content Item Integration - Instructor ArticlesHow do I add VeriCite LTI as a content item in my Brightspace course? 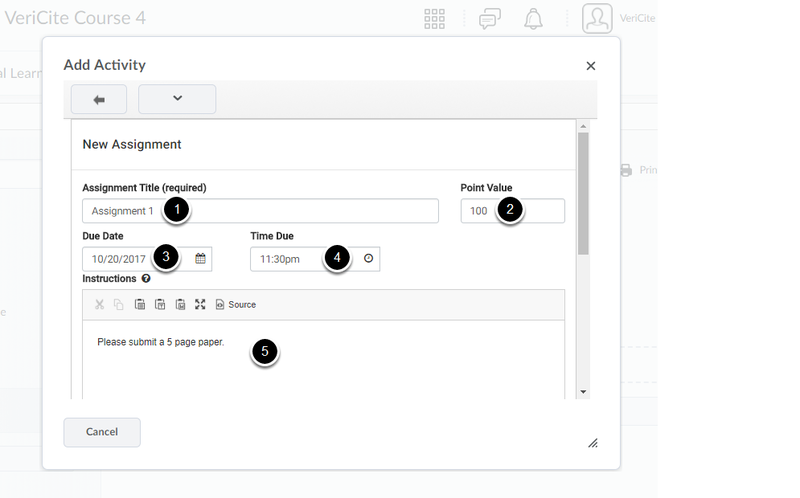 In order to add VeriCite to a Brightspace course, your Brightspace administrator must first set up VeriCite as a content item tool provider in the system. Add VeriCite as an Existing Activity. 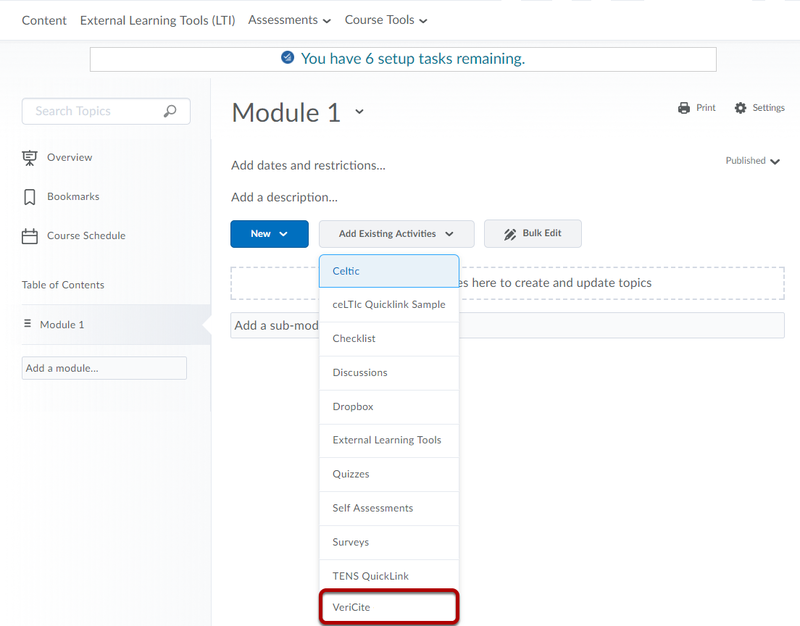 Navigate to the module where you would like to include VeriCite and click Add Existing Activities. Zoom: Navigate to the module where you would like to include VeriCite and click Add Existing Activities. Select VeriCite from the drop-down list of available activities. Zoom: elect VeriCite from the drop-down list of available activities. Note: If you do not see VeriCite in this list, your Brightspace Administrator has not yet made the tool available. Zoom: Enter your assignment details. Scroll down to view/modify additional options and Save. 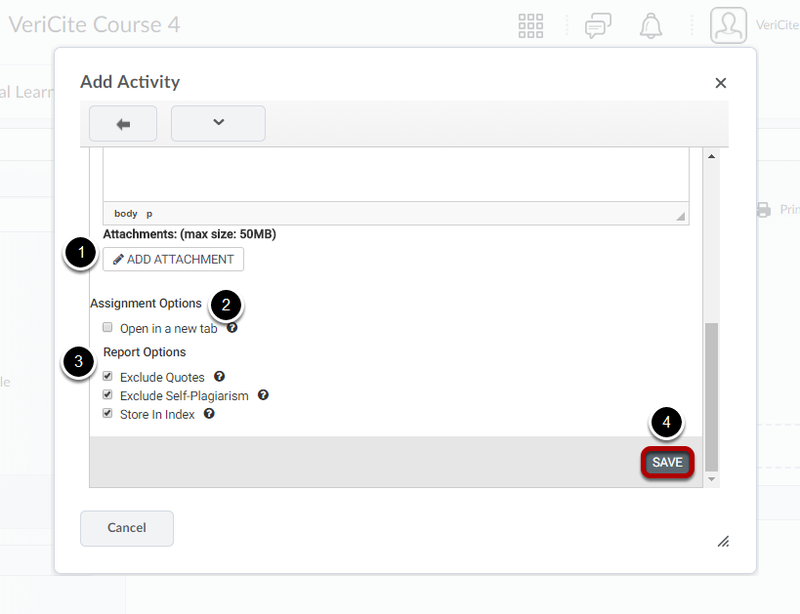 In the Report Options section, you may view or modify the default settings for this assignment. By default, these options are all enabled. Then, click the Save button at the bottom to save your assignment details. The VeriCite assignment has been added to the course. You do not need to add the assignment to your gradebook. 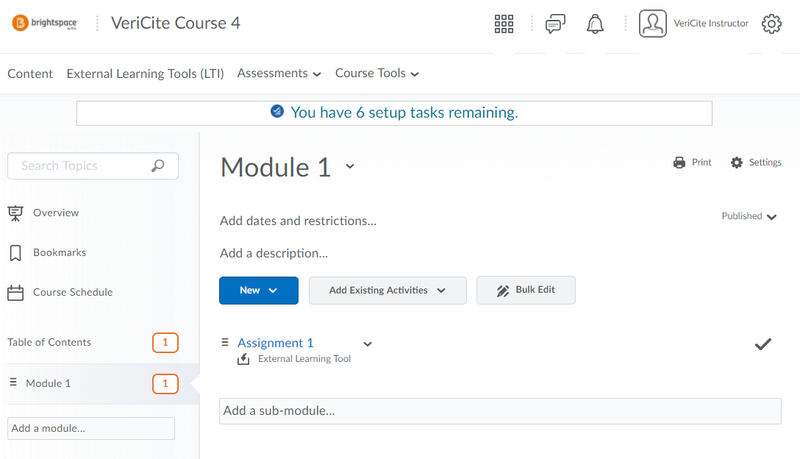 Once a student submits to the assignment, and you enter a grade for the submission, the assignment and student grades will be added to the Grades area automatically. Note: It is important to note that at least one student must submit to the assignment (not the instructor submitting on behalf of students) and the submission must be graded before the VeriCite assignment will appear as an item in the gradebook.